The article deals with driver rehabilitation programs. This program is intended for drivers whose driving licenses have been revoked for repeated traffic offenses or for transport crimes. This program aims to change the behavior and attitudes of dangerous drivers. The program consists of 6 group meetings, each lasting 4 hours. The meetings themselves combine education and therapeutic intervention. The process includes both, the work of the instructors, as well as group effort. Typical participants of this program are DWI/DUI drivers. The rehabilitation program works in most European countries. In the Czech Republic the program is currently in trial stages. This study presents step-by-step structure of driver rehabilitation program in the Czech Republic. The authors also attempt to assess the efficiency of this program. It is always important to consider the possibilities of evaluating such measures in the implementation of any action aimed at changing the behavior and attitudes of an individual. In traffic safety it is a well-known fact that the human factor is a major or important contributing factor in 90% of accidents and the 63% of these accidents are due to dangerous driving behavior (e.g., aggressive driving, speeding) . This is not as much a mere mistake as a deliberate abuse. Violations of traffic laws are much more common, than for example the insufficient processing of information .The European Commission for Mobility and Transport has an aim of halving road-traffic fatalities by 2020 as compared to 2010. Furthermore, when calculated per vehicle distance travelled, the risk of dying in a road accident in the Czech Republic is approximately four times higher than in Sweden or Great Britain. As a result, road traffic accidents during 2015-2016 resulted in tangible costs approaching (approx. 1 600 000 €). This illustrates a clear need to improve road-traffic safety within the Czech Republic specifically. The reason of higher traffic accidents can be different. Early studies mention driver´s absence of negative feedback. The lack or absence of negative feedback reinforces the beliefs in a low probability of accidents  and drivers subjectively feel a greater chance of avoiding a traffic accident than others . Lack of feedback, along with a perceived improvement in driving skills during the first years of driving contributes to changing the perception of the consequences of risky behavior , the overestimation of driving skills  and the negative impact on risk perception . A big step in the right direction was the introduction of a demerit point system that can provide the necessary feedback. It is well established that the demerit point system leads to a reduction in the number of accidents and a large reduction in road deaths ,; however, the gradual improvement of traffic safety after the first year of operation reduces and has a lower effect on mortality on the motorways ; . Although the effectiveness of the demerit point system is generally highest within the first two years of implementation , the use of seat belts and child seats has a long term effect , not only for drivers, but also for the passengers . This is very important because the use of seat belts and child seats is the most effective way to prevent serious injuries and deaths in traffic accidents . The point system, thus, has two basic big benefits: a long-term positive effect on the reduction of certain risky behaviors and the identification of those drivers who prove unreliable and dangerous. Those who prove to be unreliable face some form of penalty (i.e., loss of driving privileges, loss of freedom, imprisonment, etc.) or they must attend a traffic psychological examination for the purpose of proving their mental fitness for driving. The actual punishment has the potential to change the behavior in roughly 5-15% of people without the appropriate accompanying measures, and then the offenders have a high recidivism rate. At the same time a traffic psychological examination is a selective tool, so it does not include remedy potential. The ideal accompanying measures are suitably selected rehabilitation programs that are designed to change the behavior of specific (groups of) offenders. Rehabilitation programs (usually referred to in the literature as rehabilitation programs or driver improvement courses) are effective and well-tested tools for reducing recidivism problems in drivers. In the US we can find driver rehabilitation programs especially for drivers with disability , or for older drivers ; . Otherwise, usually are rehabilitation programs intended for drivers who repeatedly break the traffic rules. Currently, programs appear in various forms with different designs in almost all countries of the EU and the US. Over the last 30 years in Europe this has become an important measure mainly because of the "reintegration" of problematic drivers. Rehabilitation programs are, due to their long history, one of the best of the evaluated tools. Long-term evaluation  shows a reduction in recidivism of about 50%. The biggest evaluation in the European context, which was carried out under project DRUID and included 90 different rehabilitation programs in 12 EU countries (England, Belgium, France, Italy, Hungary, Germany, the Netherlands, Poland, Portugal, Austria, Sweden, Switzerland), showed a 15 to 71% reduction in recidivism, depending on the type of program. The highest efficiency was achieved by the programs in conjunction with taking away the driver’s license  or with using an alcohol lock. No effectiveness was shown by programs based only on education. Most recently, rehabilitation programs were introduced in the Slovak Republic for drivers who drove under the influence of alcohol with the effect of reducing recidivism by at least 30%. In this sight of view rehabilitation programs is defined as "the systematic measures for drivers who violated traffic rules — especially drivers under the influence of alcohol and drugs, and drivers who considerably exceeded speed limits" . The main objective of these programs is to change attitudes towards traffic regulations and to improve social responsibility for driving. Drivers who are in the program usually do not have problems with driving motor vehicles or dealing with a variety of traffic situations, but rather in planning trips (e.g., with regard to DUI), responsibility, risk perception, and access to driving regulations or general rules. These areas would greatly affect how drivers perceive traffic rules and other safety recommendations ; . Most drivers believe that the likelihood of an accident or other adverse event while driving is less for themselves than for others . This unrealistic optimism or comparative optimism  is distinctive for drivers  since most drivers expect that they have above average driving skills ; . The rehabilitation courses focus on these areas, and work with them is an important part of the course. In terms of driving safety, behavior can be divided into four levels: 1) control of vehicles; 2) mastering driving situations; 3) objectives and context management; and 4) goals and skills in the context of lifestyle (according to GDE Matrix ). Mastering the first two is necessary but not sufficient for safe behavior on the road. Under the current system of education for drivers (i.e., driving schools) these are the only two that are developed. The objectives and purposes of the journey (e.g., deciding when, with whom, and whether we drive; who should drive the chosen route; if we go during the day or night; in what condition we will drive, including under the influence of alcohol, stressed, fatigued, etc. ; and who will be in the car) usually are not considered, although these are fundamental within the driving context, including the motivation to drive itself. Also, the fourth level, which deals with life goals and motives, is nowhere emphasized. Our individuality, lifestyle, and daily lives, however, also affect our approach to managing our behavior while driving to a high degree. Rehabilitation programs focus on these two "higher" levels and, thus, have the potential for long-term change in drivers. Drivers´ rehabilitation programs in the Czech Republic are intended for drivers, who were withdrawn driving license for repeatedly traffic offences or for transport crime. For this population, the programs are designed as 4 hours group meetings (6 meetings) which can be supplemented, if necessary, with individual sessions and therapy. The meetings themselves combine education and therapeutic intervention. In this framework, not only is the therapeutic work of instructors used, but also group dynamics. Size of the group should not exceed 15 participants. Optimum group members are eight. It is appropriate if the group is heterogeneous in terms of the age and personality characteristics of the participants. The composition of the group in terms of the type of offense is always debatable. In principle, it is possible to assemble a group of drivers who have committed different types of offenses, as well as to assemble a group of offenders who have committed the same type of offense. Each of these approaches has its advantages and disadvantages. According to structure of drivers´ rehabilitation programs abroad and evaluation of effective factors  we offered following structure. First meeting is devoted to: introduction, presentation of the program, getting to know the participants, formalities and administration. Main aim of this first meeting is to: familiarize participants with the course program, map the expectations and concerns of participants, create a safe environment for open collaboration and ensure the formal and administrative guidelines necessary for the smooth running of the program. During this meeting each participant is introduce themselves, or it is possible to use a technique that simultaneously contributes to relieving the atmosphere in the group. It is advisable that instructors define the required areas of information communicated during the introduction. At this time at the latest, participants should be given a name tag with the name that they will use during the program. Then we concern on expectation in connection with the course on each of them. Participants write their expectation on small card. Then the instructors stand on either side of the room. Each instructor takes half of the cards and takes turns reading the fears or expectations to the group. Depending on whether the expectations and concerns are shared, participants move to stand near the instructor who read the card or on the opposite side next to the other instructor (or, according to the level of agreement, anywhere on the imaginary line between the two instructors). This is visualization for how distributed the different concerns and expectations are, and to what extent the various concerns and expectations of the participants are shared. At the last phase of the first meeting we define rules. Participants are invited to add group rules. The aim is to induce a consensus on various rules. It should also be supplemented by penalties for violations. Participants may freely formulate rules or they can be divided into smaller groups and each group can then present requirements for the approval of the others. Rules should be written on a flipchart and posted in the course rooms for the duration of the course. After the agreement of participants and instructors, the rules can be adjusted or supplemented continuously. This group meeting (as well as all other group meetings) ends with verbal sharing of all participants. Second meeting is devoted to analysis of the offenses — serious moving violations or the accidents of participants, or offenses that were the direct cause for the revocation of a driver’s license. In some countries (e.g., Spain) where the implementation of rehabilitation courses uses an educational approach, the subject of the specific offence and a general recap of experiences behind the wheel are pushed to the side. By contrast, in other countries (e.g., Austria) this is one of the key components of rehabilitation interventions. Also in the Czech environment, authentic experiences have proven to work to the maximum extent possible and the participants use their specific experiences and mistakes as guides throughout the whole course. During this meeting participant, in any order, talk either about the offense that resulted in the loss of their driver’s license or selected offenses in their driving history they consider to be the most serious. For thinking about the offense and preparing for the course, the following indicative questions can be used (What led to the offense? What exactly happened? What were the consequences of the offense? What will the consequences be for the rest of your life? Who is affected by the offense? How else could the whole situation have concluded? Which particular dangerous behaviors are related? How often does the participant exhibit such behavior? How could the situation have been prevented? ). This recapitulation of the traffic offence takes all of the time devoted to this meeting. Third meeting is devoted to alcohol and substance abuse effect. Main aim of this meeting is to: explain to participants the effects of alcohol and other addictive substances on the human body, explain the mechanisms of the absorption of alcohol into the blood and the mechanisms of the degradation of alcohol from the body, familiarize participants with the methods of calculating blood alcohol level, teach participants to separate drinking and driving. · In 2010, 6,500 less people might have died on Europe's roads (Road safety department – Ministry of Transport of the Czech Republic). · An alcohol level of 0.8 per mille increases the risk of driver involvement in a traffic accident by 2.7 times. If the value reaches 1.5 per mile, the risk increase 22 times, at the same time it exposes people to a 200 times greater risk of a fatal accident (Police of the Czech republic statistics). · On the other hand, alcohol is a component of Central European culture and it is very difficult to avoid its consumption. The aim of the rehabilitation program, therefore, is not to prevent anybody from enjoying alcohol. The key objective is to learn to separate drinking and driving. Second phase of this meeting is concerned on understanding alcohol absorption and degradation. This phase helps drivers´ better planning of alcohol consumption and separating of drinking and driving. Our philosophy is not to lead to a strict abstinence (this approach often causes the opposite effect), but to changing approach to driving for more responsible. We also try to destroy myths connected with driving under influence of alcohol (DUI) and about alcohol, and drugs effects in blood. We use it for this phase concrete participant´s situation. 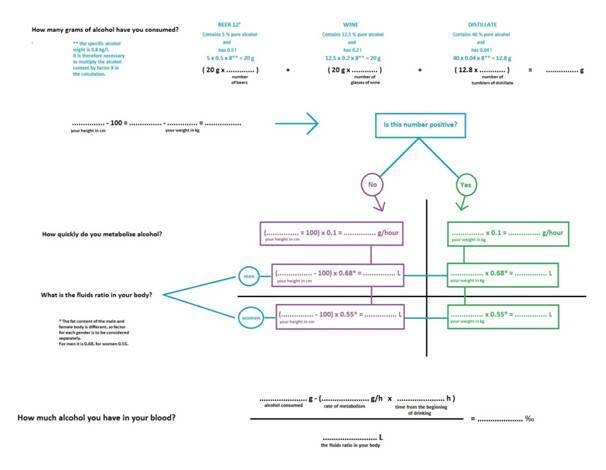 We use for counting of blood alcohol concentration (BAC) scheme below. Also this group meeting ends with verbal sharing of all participants. Fourth meeting is devoted to encourage perception of consequences of breaking the traffic rules. Main aims of this meeting is to: encourage of risk driving perceiving, review the most important rules of the road, explain why it is good to follow traffic rules, help participants build a model for ideal individual driving behavior — with a reflection of risk, strengthen the sense of responsibility towards others — further strengthen the reflection on the consequences of high-risk behavior. On the subject of perception of the traffic rules we can recommended primarily a group wide debate, but you can also chose to have discussions in small groups or pairs to work on homework. It is always necessary for the instructors to lead the following discussion of the group, and the instructors need to point out the rules of life if the participants won’t realize them themselves. We usually use following questions for encourage discussion (Which traffic rules cause me problems to follow? Is there a rule that I have never violated? Why this rule? How often have you violated this rule without being caught? In what situations do I most often break the rules? On the contrary, are there some situations where I manage to observe them? How many times have I been caught violating this rule in one year /five years/ my entire driving career? Did I continue to repeat the same offense, even though I was caught? In my opinion, what is the meaning of this rule? From what does it protect me or other drivers? What would happen if everyone violated it? How would it look on the roads? What other areas of your life are guided by rules? What rules do you expect that others follow? What would happen if they were not upheld? ). The ideal is to guide the driver to realize that the rules have a purpose, even if they themselves do not see it at the moment. For example, we may not know the reason one must reduce speed in a section of road that seems clear and straight. Breaking the rules can both lead to problems with the law and, above all, an accident could occur. Realizing that my behavior can hurt other people completely innocent people has great potential for starting a reflection on my risky behavior. As part of working with this topic, we recommend using the technique “Letter to Victims”. Participants are asked to recall the most serious accident they caused or an offense in their driving history. Then, they should think of who their risky behavior in this situation hurt or could have harmed. Their task is to write a letter to that person. After the letter is finished, it is their job to try, to the maximum extent possible, to empathize with the victim, and write an imaginary response. During group verbal sharing we recommend to ask a few following questions (What was it like to write the letter? What was the hardest part? What was surprising? Which letter they wrote was better — the letter from the offender, or from the victim? ). If they wish, participants can read all or part of the letters, although no one should be to force to do it. In case the only real victims of the risky behavior would be the participants themselves, we ask them to imagine that one of their loved ones is in the role of the victim and might be hurt because the participants endangered themselves. It is appropriate to leave space for all participants in the group to comment and reflect upon the testimony of others. Fifth meeting is devoted to the first aid giving. The main aim is to: increasing the level of knowledge of first aid; increasing the level of first aid skills; increasing the level of real psychological readiness for first aid, and increasing motivation to actively intervene in emergency situations; clear visualization of a traffic accident, which has a preventive potential in relation to safe driving behavior; increasing awareness of responsibility and strengthening social behavior. A first aid course is an important part of the rehabilitation program. Besides increasing readiness to provide first aid in general life and not just during a traffic accident, it also has the preventive potential to reduce risky behavior behind the wheel. The course may be conducted by instructors within the rehabilitation program (if they have the necessary qualifications), but it is more realistic to engage an experienced first aid instructor. The first aid course should provide basic theoretical information and it should offer practical information. It is ideal if the experiential methodology is implemented using simulated situations and followed by subsequent complex analysis. This methodology not only boosts the real readiness of the participants to act in an emergency situation, but it also mediates the complex sensation of the accident, which results in certain preventive potential. For further detail and structure of first aid course see . Sixth meeting is devoted to the themes selected by the participants (stress and fatigue behind the wheel, and emotions behind the wheel), followed by the creation of personal strategies to avoid risky behavior behind the wheel, the completion of the course, and the closure of group topics. For the first phase of this meeting we choose one of higher topic. Usually we solve stress emotions during driving. For many participants, success with emotions will be simply to be able to speak about them, think about them, and name them. Listening to one’s body and emotions is helpful for drivers because it provides feedback about the current level of stress, frustration tolerance, and tendency to react excessively. We lead participants to recall the latest (or strongest) experience where emotion took control of their driving. Furthermore, we ask questions (What triggered the emotion? Were there other factors that increased or reduced the impact on the driving? How did I express myself under the influence of this emotion? Is there something /a person, a thing, a change of view/ that would have helped to control and reduce the impact of my emotions at that specific moment? Could I have acted differently? What would it take to facilitate this type of behavior? If not, would I have acted differently today? What would I change? ). · How do I change my driving? · How specifically will the changes reflect on my driving behavior in different situations? · How will the changes be reflected in other areas of my life? · What do I need for the change first of all? · Who do I primarily need to help me change? · What are the critical moments I will find particularly challenging? At the end of this meeting participants evaluate their expectations and the fulfillment of objectives. Reflection-achieved changes based on group process. Each participant is asked to recall the objectives and expectations with which they started their participation in the group, and to assess whether change occurred from the beginning of the group in connection with these objectives. It is especially important to learn what they gained from the group that will help them achieve their goals. Rehabilitation programs are an integral part of the prevention of the recurrence of risky driving behavior in most Western countries. In the Czech Republic, however, this issue has been neglected for years. Many drivers, despite the efforts of the police and the courts, have repeatedly risked their lives and the lives of others without being given the space to think about the causes of their behavior or the most effective ways to change it. People continue to die on Czech roads, many unnecessarily. An interest in finding out the effectiveness of the drivers´ rehabilitation programs is since the programs establish ; . Meanwhile, methods of measuring effectiveness were focused on the participant´s self-report in combination with objective data (probation worker etc.) to achieve triangulation of the data . Nowadays, practitioners focus on more accurate measurement of the effectiveness of drivers´ rehabilitation programs. In this respect, it is particularly useful to measure effectiveness using experimental design and technology of hyper scanning. Traditionally, neuroscientific studies of empathy have used functional magnetic resonance imaging (fMRI) to measure an individual's neural empathic response to socio-emotional stimuli observed passively (for reviews see ; ). More recently, however, there is an increasing awareness that we live in highly complex social environments, and our socio­emotional behavior manifests as a response to others in our social environment . In this light, investigating the relationship between empathy and risky driving requires an interactive context - one in which brain function is measured from drivers as they interact with others in real social contexts. Recent studies have begun to focus on brain-to-brain coupling - that is, when the brains of two actively interacting individuals mirror one another ; ; . This can be achieved with "hyperscanning", whereby two functional MRI scanners are combined in order to measure brain function from pairs of individuals simultaneously. Despite its potential, this promising technique hasn´t yet been fully developed, and is yet to be introduced in Czech Republic. This kind technique measures brain function in pairs of drivers as they interact on socio-emotional tasks. This unique application of "hyperscanning" will provide an ecologically valid yet objective method with which to measure behavioral and neurophysiological indices of empathy, and for the evaluation of drivers´ rehabilitation programs. Our novel evaluative technique will permit the assessment of whether or not specific drivers´ rehabilitation enhances behavioral and/or neurophysiological measures of cognitive and/or affective empathy in dangerous drivers. To achieve the ultimate goal of reducing road traffic accidents in Czech Republic, the results of this evaluation will be used to update content of current driver rehabilitation programs in the Czech Republic and serve as a guideline for rehabilitation practices elsewhere throughout Europe. These findings will be communicated to the relevant authorities and policy makers in Czech Republic, and to other traffic research centers throughout Europe. Outcomes of this type of measurement could be very useful. This article was produced with the financial support of the Czech Science Foundation (GACR), project: Improving driver – rehabilitation programs: A neurobehavioural evaluation of Empathy Induction (16-18261S), on the Research infrastructure acquired from the Operation Programme Research and Development for Innovations (CZ.1.05/2.1.00/03.0064). Najeeb, M. A. A study of the psychological factors that influence the rule violation behavior of drivers // In Conference Road safety in a globalised and more sustainable world – current issues and future challenges, 2012. Reason, J. T., Manstead, A. S. R., Stradling, S. G., Baxter, J. S., Campbell, K. Errors and violations on the road: A real distinction? // Ergonomics, 1990. Vol. 33, No. 10-11. PP. 1315-1332. Fuller, R. Behavior analysis and unsafe driving: warning learning trap ahead! // Journal of Applied Behavior Analysis, 1991. Vol. 24, No. 1. PP. 73-75. Cestac, J., Paran, F., Delhomme, P. Young drivers’ sensation seeking, subjective norms, and perceived behavioral control and their roles in predicting speeding intention: How risk-taking motivation evolve with gender and driving experience // Safety Science, 2011. Vol. 49, No. 3. PP. 424-432. Delhomme, P., Verlhiac, J.-F., Martha, C. Are drivers’ comparative risk judgments about speeding realistic? // Journal of Safety Research, 2009. Vol. 40, No. 5. PP. 333-339. Whissell, R., Bigelow, B. The speeding attitude scale and the role of sensation seeking in profilig young drivers at risk. // Risk Analysis: An International Journal, 2003. Vol. 23, No. 4. PP. 811-820. Rosenbloom, T. Risk evaluation and risky behavior of high and low sensation seekers // Social Behavior and Personality, 2003. Vol. 31, No. 4. PP. 375-386. Pulido, J. Lardelli, P., De la Fuente, L., Flores, V. M., Vallejo, F., Regidor, E. Impact of the demerit point system on road traffic accident mortality in Spain // Journal of Epidemiology and Community Health, 2010. Vol. 64, No. 3. PP. 274-276. Butler, J. S., Burke, J. P., Healy, D. G., Stephens, M. M., McManus, F., McCormack, D., ..., Poynton, A. R. Trends in RTA related spinal injuries: the post penalty points era // Irish journal of medical science, 2006. Vol. 175, No. 1. PP. 20-23. Farchi, S., Chini, F., Rossi, P. G., Camilloni, L., Borgia, P., Guasticchi, G. Evaluation of the health effects of the new driving penalty point system in the Lazio Region, Italy, 2001-4 // Injury Prevention, 2007. Vol. 13, No. 1. PP. 60-64. Castillo-Manzano, J. I., Castro-Nuño, M., Pedregal-Tercero, D. J. An econometric analysis of the effects of the penalty points system driver's license in Spain // Accident Analysis and Prevention, 2010. Vol. 42, No. 4. PP. 987-1420. Zambon, F., Fedeli, U., Milan, G., Brocco, S., Marchesan, M., Cinquetti, S., Spolaore, P. Sustainability of the effects of the demerit points system on seat belt use: A region-wide before-and-after observational study in Italy // Accident Analysis and Prevention, 2008. Vol. 40, No. 1. PP. 231-237. Zambon, F., Fedeli, U., Visentin, C., Marchesan, M., Avossa, F., Brocco, S., Spolaore, P. Evidence-based policy on road safety: the effect of the demerit points system on seat belt use and health outcomes // Journal of Epidemiology and Community Health, 2007. Vol. 61, No. 10. PP. 877-881. Waller, P. F. Challenges in motor vehicle safety // Annual review of public health, 2002. Vol. 23, No. 1. PP. 93-113. Lane, A., Green, E., Dickerson, A. E., Davis, E. S., Rolland, B., Stohler, J. T. Driver rehabilitation programs: Defining program models, services and expertise // Occupational therapy in health care, 2014. Vol. 28, No. 2. PP. 177-187. Betz, M. E., Dickerson, A., Coolman, T., Davis, E. S., Jones, J. Schwartz, R. Driving rehabilitation programs for older drivers in the United States // Occupational therapy in health care, 2014. Vol. 28, No. 3. PP. 306-317. Wheatley, C. J. Survey of licensing requirements for driver rehabilitation programs in the United States // Foster Occupational Therapy Engagement in Older Drivers: Addressing Gaps through Pathways, 2015. Bartl, G., Assailly, J.-P., Chatenet, F., Hatakka, M., Keskinen, E., Willmes-Lenz, G. EU-Project „Andrea“. Analysis of driver rehabilitation programmes // KFV, Wien, 2002. Masten, S. V., Peck, R. C. Problem driver mediation: A meta-analysis of the driver improvement literature // Journal of Safety Research, 2004. Vol. 35. PP. 403-425. Iversen, H., Rundmo, T. Attitudes towards traffic safety, driving behaviour and accident involvement among the Norwegian public // Ergonomics, 2004. Vol. 47, No. 5. PP. 555-572. Ulleberg, P., Rundmo, T. Personality, attitudes and risk perception as predictors of risky driving behaviour among young drivers // Safety science, 2003. Vol. 41, No. 5. PP. 427-443. Castanier, C., Paran, F., Delhomme, P. Risk of crashing with a tram: Perceptions of pedestrians, cyclists, and motorists // Transportation research part F: Traffic psychology and behavior, 2012. Vol. 15, No. 4. PP. 387-394. Harris, P., Middleton, W. The illusion of control and optimism about health: On being less at risk but no more in control than others // British Journal of Social Psychology, 1994. Vol. 33, No. 4. PP. 369-386. Delhomme, P. Comparing one's driving with others': assessment of abilities and frequency of offences. Evidence for a superior conformity of self-bias? // Accident Analysis and Prevention, 1991. Vol. 23, No. 6. PP. 493-508. Horswill, M. S., Waylen, A. E., Tofield, M. I. Drivers' ratings of different components of their own driving skill: A greater illusion of superiority for skills that relate to accident involvement // Journal of Applied Social Psychology, 2004. Vol. 34, No. 1. PP. 177-195. Řezáč, P., Kurečková, V., Zámečník, P., Trepáčová, M. Comparison of Young Offender Drivers with Young Non-problematic Drivers [online) // Global Journal of Research in Social Sciences, 2017. Vol. 3, No. 1. 173-180. Hatakka, M., Keskinen, E., Gregersen, N. P., Glad, A., Hernetkoski, K. (2002) From kontrol of the vehicle to personal self-control; broadening the perspectives to driver education. Transportation Research Part F, 5 (3), 201-215. Widmark, E., M., P. Principles and applications of medicolegal alcohol determination. Biomedical Publications, Davis California, 1932. Fine, E. W., Steer, R. A., Scoles, P. E. Relationship between blood alcohol concentration and self-reported drinking behavior // Journal of studies on alcohol, 1978. Vol. 39, No. 3, 466-472. Stewart, K., Ellingstad, V. S. Rehabilitation countermeasures for drinking drivers // Background papers, Surgeon General´s Workshop on Drunken Driving, 1989. PP. 234-246. Fitzpatrick, J. L. Problems in the evaluation of treatment programs for drunk drivers: Goals and outcomes // The Journal of Drug Issues, 1992. Vol. 22. PP. 155-167. Bernhardt, B. C., Singer, T. The neural basis of empathy // Annual Review of Neuroscience, 2012. Vol. 35. PP. 1-23. Singer, T., Lamm, C. The social neuroscience of empathy // Annals of the New York Academy of Sciences, 2009. Vol. 1156, No. 1. PP. 81-96. Konvalinka, I., Roepstorff, A. The two-brain approach: How can mutually interacting brains teach us something about social interaction? // Frontiers in human neuroscience, 2012. Vol. 6, No. 215. PP. 1-10. Anders, S., Heinzle, J., Weiskopf, N., Ethofer, T., Haynes, J. D. Flow of affective information between communicating brains // NeuroImage, 2011. Vol. 54, No. 1. PP. 439-446. Astolfi, L., Toppi, J., Fallani, F. D. V., Vecchiato, G., Cincotti, F., Wilke, C. T. et al. Imaging the social brain by simultaneous hyperscanning during subject interaction // IEEE intelligent systems, 2011. Vol. 26, No. 5. PP. 38. Hasson, U., Ghanzanfar, A. A., Galantucci, B., Garrod, S., Keysers, C. Brain-to-brain coupling: A mechanism for creating and sharing a social world // Trends in cognitive sciences, 2012. Vol. 16, No. 2. PP. 114-121.